After a two hour walk across several hills and through valleys in a mountainous part of Timor-Leste, have Paula and her four-year-old daughter Maria arrived at a simulation exercise of the integrated community health service. Driven by guilt she embarked on her tiresome journey with febrile Maria. As I watch Paula line up amongst the many others jostling to register for health care in this remote sub-district of Marobo, I could not help but wonder where all these Timorese had come from. This is a western part of the country with very little in the way of facilities or even infrastructure. Today’s activities are being carried out on the grounds of a recently completed school, where a makeshift thatched roof of dried palm leaves is providing limited shelter from the scotching sun. In this covered area are several booths for the community to visit and receive basic medical care. It begins with a registration booth. Many here proudly tell the assistants their names and where they have come from but the old swiftly fumble when asked their age. They are simple cannot remember. Shortly after they are given a slip of paper with their names written in bold, they are whisked away to the next booth. A couple of weighing scales are placed on the dusty ground and each individual is asked to stand on the weighing scales so that the health volunteers can take note of their weight and proceed to fill the next box on this slip of paper. Children too have come with their parents but many refuse to stand on these weighing scales, terrified of this strange object. This slows the pace as the health officials struggle to find a solution and fi nally a solution is in sight. Both parent and child step confidently on the scales, a record is taken. Then the child is swiftly removed from the parent for a split second. This is hardly sufficient time to take note of the parent’s weight but it is done just before the terrified child is aware he is in the hands of a stranger. The result shows that many of the adults and children are underweight, some grossly. Booth number three dishes out information on reproductive health and family planning, evidently thin on patronage but nonetheless those manning the booth are gradually soliciting interest. A husband and wife, with their three children ranging from eight months to four years, are being coerced into better family planning. The young mother is shy and giggles occasionally but the father seemed noticeably perturbed, not by what the ladies at this booth are saying but the restlessness of the infant in his arms. After a sojourn of less than ten minutes they make their way to the next booth. It is here where a little more enthusiasm ignites the children. They are each given a bar of soap to wash their hands and dirty little fingers. It’s the sanitation booth where parents and children are sensitized to the importance of basic hygiene. “You’ve got such a pretty little face but look at that black dirt beneath your finger nails,” exclaims the health worker who then embarks on cutting the child’s fingernails. Embarrassed by the comments, the child nestles her face into her mother’s armpits. She quickly perks up again when she’s given a tiny bag containing a small face towel and a bar of soap to take home. There seems to be a longer wait at booth five, several rows of young and old men and women, already seated in line, waiting their turn to consult with the several doctors available. Waiting patiently is Paula and Maria. “I just hope the doctors can tell me what is causing Maria to be this sick. I want some answers. Maria has been unwell now with a high fever for the last four days and when it gets too much, she screams and I feel so helpless. I cradle her in my arms and kneel in front of our altar at home,” says the mother of three. The simulation exercise is gaining momentum. “I’m pleased to see so many people here today. This is a good sign that SISCa is working,” comments the Minister of Health for Timor- Leste, Dr Nelson Martin. But could this be because the minister himself has come from the capital, Dili and the district chief and village heads have mobilized the community to welcome the guest and his entourage? “I’m convinced at least some of these people have come for their benefit and not because I’m here. That is my hope after all the aim of SISCa is about community participation for equitable distribution of health care. But I also believe only through greater advocacy will this service work better ensuring health care for all is possible” stressed Dr Martins who is observing the last of the simulation exercises to take place today in this sub-district located in the west of the country bordering Indonesia. Meanwhile, Maria is pricked on her finger gently by the attending nurse so that a rapid test on her blood can be done to check against Malaria. It clearly does not hurt her but instead she is intrigued by the process. The prognosis is negative for Malaria. It’s a viral infection and because she has not had it treated till now, the infection led to the high fever. Paula listens intently to the doctor relieved so hear some answers. She takes note of what she should do with the medication she will receive from the pharmacists at the next booth and also how she can take simple steps at home to ensure this does not happen again to Maria or other members of her family. “It will be awhile before we reach home now but I’m glad we came. Look even Maria is feeling better already it seems,” quips Paula as she places a bottle of water and some bananas in her a woven basket and begins her journey home. Servisu Integradu da Saúde Communitária (SISCa) which translates from Portuguese to Integrated Community Health Services stands on the principle of “From, With and To the Community”, which signifies that it is the community who would help conduct the activity, mobilize people; men and women, children, youth, the elderly; together with all health workers to work side by side to give assistance, protect and improve the state of community health in the country. Communities need to be part of this strong commitment to the importance of health. Hence, community leaders such as sub-district council members and chiefs, hamlet chiefs, youth organizations, women’s’ networks and other community leaders take the lead. SISCa provides assistance in the areas of health promotion, prevention of diseases, treatment for sickness and rehabilitation as well as health interventions such as combating against infectious diseases, family planning, nutrition, maternal and child health and environmental health. It covers all sub-districts in all 13 districts in the country. Its activities are carried out once a month to ensure sustainability. The activities at SISCa last for a minimum of four hours, to ensure that communities will have time and the opportunity to participate. Community members play a role in deciding the schedule of SISCa activities. Dr Eisuke Fukuma, Director of Breast Cancer, Kameda Medical Centre at Chiba, Japan, has done pioneering work in the field of endoscopic breast surgery and cryosurgery as a nonsurgical ablation. He was recently in India to attend a conference on Minimal Invasive Surgery, hosted during the 35th Annual Conference of the Association of Surgeons of India, UP Chapter, at Lucknow, India, where he wowed everyone with his simplicity of manners and surgical expertise in the field of Endoscopic Breast Surgery. In an exclusive interview to Citizen News Service (CNS), he spoke at length on the recent advances made in the area of breast surgery. Breast cancer is on the rise in India, with 80,000 new cases being added every year and an annual death toll of more than 14,000. Yet there is very little awareness about the disease, especially in its earlier stages. Also, India has very few female breast surgeons, which very often acts as a deterrent to the female patients in seeking medical/surgical interventions. According to Dr Fukuma, this issue merits a lot of attention, as women need to seek medical intervention during the first stage of the disease. Surgery is ruled out completely in the third stage. He stressed upon the dire need of good quality and sustained breast screening programmes in India, in the same manner as polio eradication programmes. In Japan, with 40,000 new cases added every year, one, out of every 20, Japanese women suffers from breast cancer. But government sponsored breast screening /awareness programmes done, with the help of MRI, under strict quality control are helping in early detection. Hence timely treatment of the disease is saving many lives. At Kameda Medical Centre, 50% of the breast surgeons are women. At present, out of the 5 resident doctors in the hospital’s department of breast surgery, 4 are women. This has gone a long way in encouraging women to seek medical advice. Endoscopic breast conserving surgery was developed originally in Japan, with a view to improve the cosmetic shape of the breast by reducing the scar-size and by changing the position of the surgical wounds. The purpose of endoscopic breast surgery (EBS) is to minimise skin incision and excision, as a skin sparing mastectomy. This technique uses a long, narrow tube, called endoscope, which allows tiny surgical instruments to be inserted at a point far from the actual site of surgery. It is non invasive surgery, allowing for very small and precise incisions, without damaging nearby healthy tissues. The surgeon is able to reach the entire breast through a one cm. hole made in the anterior auxilla (lower armpit), through which the tumour is removed. This is called the ‘trans auxiliary retro maminary route’. The cut is so small that it leaves no scar, and the front/upper part of the breast is untouched, obliterating the necessity of contour surgery in most cases. Post surgery, sometimes a depression may appear in the breast which can be simultaneously corrected with breast implants, working through the same holes. Thus, this scar less breast surgery, avoids the second corrective/cosmetic surgery to reshape the breast contour, as both can be done at the same time. Dr Fukuma started the technique of OSEA - ‘Oncoplastic Surgery With Endoscopic Approach’ in 1995, at the 900 bedded Kameda Medical Centre in Chiba, Japan. Till to date, he has operated upon 2000 patients, with this new technique, and has performed more than 400 total mastectomies with simultaneous reconstruction. According to him, the survival rate in endoscopic breast surgery is an encouraging 95%. Currently about 80% of the patients in Japan are opting for this type of breast surgery, as its cost is the same as that of conventional surgery, and the benefits are immense. The cosmetic goal of OSEA is to maintain the four S – size, shape, softness and symmetry of the breast. Add to this two more S of Scar Minimize and Spare the Normal Tissue. This hybrid technique, perfected by Dr Fukuma, to suit the Asian women (who have smaller breasts as compared to their western sisters), entails simultaneous/staged reconstruction after endoscopic total mastectomy; augmentation of breast and mobilization of tissue from the breast or other than the breast. Dr Fukuma is also very optimistic about the future of Cryosurgery, which is the latest in the field of surgery, and can be used for removing small tumours of the size of 1cm or less. In cryosurgery, an image guided needle is inserted through a 3mm incision (the size of a mosquito bite). The tip of this needle, which is kept at a temperature of -68oC, forms an ice ball around the tumour. The cancerous tissue is killed at this low temperature. More than 30 such non surgical cryo ablations have been performed successfully by Dr Fukuma under local anaesthesia, with the patient going back home after a few hours of hospital stay. The field of cryosurgery offers exciting possibilities. But it is still in its infancy, just being three years old, and more research is needed in this area before it replaces other conventional methods. He expressed his gratitude for being given a platform to showcase his technique through video presentations, and to share his ideas with the medical fraternity at the UPASICON 2009. He hoped that his visit to India would mark the beginning of a new chapter of collaboration between surgeons of the two countries. Dr Anand Misra of CSM Medical University, Lucknow has already trained under Dr Fukuma in Japan, and is using these techniques in treating patients, albeit partly, due to lack of proper instruments. Surely, more such training programmes can be organized, to disseminate the benefits of this latest technology to all and sundry. Dr Fukuma hopes to extirpate breast cancer completely by developing endoscopic and cryo surgery. His aim is to give a new hope to the patients and to save lives. He has assisted in endoscopic surgeries in the USA and UK, and stresses upon the need of international collaboration in this exciting field of surgery. His message is loud and clear - Fight the Menace of Breast Cancer Rather Than Surrender. We hope that he succeeds in his mission to provide high quality relief to breast cancer patients, at affordable prices, without compromising upon the beauty of the end result. Farmers all over the state of Uttar Pradesh (UP) are suffering from the crisis of diammonium phosphate (DAP) fertilizer shortage. It is wheat sowing time and most of the poor farmers have not received even a sack (50 kg) of DAP from the government fertilizer distribution centres. These farmers have been staging a demonstration since 17 November 2009 demanding DAP fertilizer, said Dr Sandeep Pandey, Ramon Magsaysay Awardee (2002) and member, National Presidium, Lok Rajniti Manch. Last week sugarcane price issue was highlighted by political parties at the national level and they even forced the central government to backtrack. "The issue of sugarcane price, no doubt quite important, concerns mostly big farmers. However, wheat is sown by all, including large number of poor and marginalized farmers. If the farmers will not get DAP we can expect a poor wheat crop and impending food shortage" said SR Darapuri, Vice President of People's Union for Civil Liberties (PUCL) UP. In addition the farmers are also facing a seed shortage. They are also harassed by the revenue department officials who charge money for using water from the canals without actually supplying them any water. "On 25th November, 2009, the farmers who have not received any DAP so far will be organizing a protest at the Bharawan (Block) fertilizer distribution centre in Hardoi District in UP state. A dharna has been going on here since 17th November, 2009" informed Rambabu, social activist with National Alliance of People's Movements (NAPM) and Asha Parivar. In September 2009, CIVIC organized the above public meeting in Bangalore with Dr. Supriya Roy Chowdhuri, Professor ISEC, Bangalore and Mr. Narayanswamy, Joint Director, Karnataka Slum Clearance Board (KSCB). The former shared findings from ISEC's National Foundation of India supported 2007 project on the Impact of Globalization on Slums and Urban Poor in Karnataka. It highlights globalization's impact and NGO's/CSO's role in reducing disparity especially in Bangalore which expanded rapidly since the 1990's through the Information Technology and Biotechnology industries. The voluntary retirement scheme (VRS) and similar policies increased unemployed and semi-skilled numbers. In 21 class I cities, population decreased but poor increased ISEC's 1973 poverty and employment ratios survey in 11 Bangalore slums and 1990 repetition in 8 found child and coolie labour increasing from 30% to 36% and 26% to 30% respectively and clerical jobs decreasing from 13% to 11%. Studying housing, livelihood, education, health, etc. in 380 households across 6 settlements (including 5 'legalized' ones) in J.C. Nagar, Bangalore through direct questions and focus group discussions in 2007 revealed: · Education, development levels vary widely with no specific job or economic clusters in a ward · Some residents are partly integrated into Bangalore's economy · Occupations: garbage pickers, 26.1 % coolies, 26.5% self-employed (plumbers, mobile/stationary vendors, etc.). Women - housemaids, cooks, nannies, etc. · 52.6 % of the poorest/unskilled earned between Rs. 1386-3372 · Poverty Ratio: Ramanna Garden - 80%, Papanna Garden - 58%, Average: Bangalore - 56% Karnataka - 26%. Some facts about 2 of the settlements surveyed K.S. Garden · Least Below Poverty Line (BPL) cases · Employment: some in NGO/government/private sector getting Rs. 6000-12000/month and benefits (receptionists, drivers, etc. ); other and skilled labour - 33.6%, low income - 52.3% · 'Push factor' - a male relative was a government employee or individuals acquired technical/English skills privately · Fringe population - unskilled, aged, alcohol/drug addicts, infirm Cement Huts · High poverty ratio · Jobs: rag pickers for 70-80 years earning Rs. 3000-4000 monthly through wholesalers or individuals getting Rs. 1500. · Women - 80% aged 40-70 married within the slum and rag pickers nearby or in Chikpete earning Rs. 1800/month. (Ironically, this is the heart of the city beside the Labour Commissioners's erstwhile office). Around 20 households revealed that their lives remained unchanged for 2 decades. · NGO's Mythri and Waste-Wise's education and vocational training to about 100 families increased their monthly income from Rs.1000 to Rs. 1600. 28% of Bangalore's slum dwellers especially young unmarried women toil long hours in the garment and electronics/electrical factories in hazardous conditions earning below Rs. 2300/month (minimum wage). Such unregulated, capital intensive and mainly export oriented industries exploit the urban poor. Urban Karnataka has less access to credit through Self Help Groups than rural areas or other Indian states although this does not deter them from self-employment as they cannot afford joblessness. Further, government schemes focus on education, sanitation rather than employment generation while most poor people prefer jobs over handouts. Housing campaigns have only provided a "roof over poverty." - Before 2006, National Slum Development Programme (NSDP) and Housing and Urban Development Corporation (HUDCO) were the only slum development schemes unlike the Jawaharlal Nehru National Urban Renewal Mission (JnNURM) which has Basic Services to Urban Poor (BSUP) and Swarna Jayanti Sahari Rozgar Yojna (SJSRY) for training and employment. - Among Bangalore's 540 settlements with 2 lakh households, 200 are notified. Ragigudda in southern Bangalore, the largest, is still under dispute. KSCB's staff shortage (only 5 AE's city wide) is slowing attempts to legalize the rest - it requests NGO's to assist its efforts. Many slum dwellers use private healthcare as Primary Health Centres (PHC's), anganwaadis, etc. are ineffective or unavailable. Also, government hospitals often demand money for 'free/discounted' services. Most government schools' poor standard denies them basic education. Only settlements like K.S. Garden where NGO's like Mythri run an anganwaadi or others, having free tutoring centres benefit. Minimal access to education, livelihood, healthcare and critical developmental schemes precipitates problems in slums. Despite lessening starvation, small jobs don't improve the socio-economic condition. Residents are disillusioned as politicians have rarely helped - some boycotted the 2004 parliamentary elections. While most slum residents know the various government schemes/benefits available to them like Bhagyalakshmi, BPL card, etc. they can rarely access them without NGO/CBO intervention. Bayer has now filed an appeal against the decision before the division bench of the Delhi High Court. The appeal is going to be heard on 18 November 2009. The case was first filed in 2008 by Bayer before the Delhi High Court on the grounds that the DCGI has entertained the application for granting marketing approval to a generic version of the anti-cancer drug sorafenib tosylate - for which Bayer has obtained a patent (IN215758) in India. By filing this case against the Indian government, Bayer wanted to set a legal precedent which would require the Drug Controller of India to link regulatory approval of generic medicines with their patent status regardless of whether the patent granted is valid or not, says treatment rights activist Leena Menghaney. She adds further that linking a drug's registration to its patent status (also known as 'patent linkage') seeks to create a new role for national drug regulatory authorities as 'enforcers' of drug patents. Normally, it is up to patent holders to ensure their patents are enforced. Patent linkage requires drug regulators to block the registration (also known as 'marketing approval') of generic versions of a drug that is under patent unless the patent holder gives consent - even if the generic has been proved to be of quality, safe and effective. Without registration a drug cannot be marketed and sold therefore, if the patent holder does not gives consent, the effect of this linkage would be to delay or even block generic competition and access to affordable drugs until the patent expires. MSF is concerned about this court case which is yet another attempt by multinational pharmaceutical companies to use litigation to prevent competition and undermine the use of provisions in Indian law to safeguard public health. Patent linkage will undermine the 'Bolar/Early Working' exception that allows a generic producer to manufacture the patented drug and obtain marketing authorisation in advance, so that a generic can be put on the market as soon as the patent expires. It will have had an especially harmful effect in relation to compulsory licenses. Compulsory licenses can be issued to generic producers if patented essential drugs are not available or affordable in India, or if countries that lack production capacity order essential drugs from India. Even if India were to issue a compulsory license to overcome a patent barrier for a life-saving medicine, this provision could block or considerably delay the marketing approval of the drug rendering the compulsory license useless. Use of such public health safeguards will become increasingly important, as the effect of the introduction of stricter patent rules for medicines required under the TRIPS Agreement is felt in India. In a similar attempt to force the Philippines to adopt patent linkage, U.S. multinational pharmaceutical company, Pfizer Ltd. In March 2006 sued the government-owned company Philippine International Trading Corporation (PITC), the Bureau of Food and Drugs (BFAD) and two BFAD officials in their personal capacity.? PITC had begun the process of registering the affordable versions of amlodipine besylate with the BFAD by submitting imported samples from India so it could obtain marketing approval (registration) and then promptly enter the market when Pfizer's Philippines patent on amlodipine besylate expired in June 2007.? The drug used to treat high blood pressure was considerably cheaper in India. Today is World Diabetes Day – a day to reflect upon why India has become the diabetes capital of the world with 50.8 million (7.1%) of its people suffering from diabetes. It is high time we prepared to combat this menace and curb its spread. As the new President of IDF has rightly remarked that either we turn off the diabetes tap or else spend our lives mopping the floor. We Indians are genetically more prone to diabetes. On top of this, a rapid shift in our dietary habits and life styles is resulting in a rapid rise in obesity, diabetes, metabolic syndrome and heart disease. Hence a proper and healthy diet remains the cornerstone of prevention and management of these diseases. Perhaps the most important reason for increasing prevalence of diabetes, obesity and hypertension is the rapidly changing imbalanced dietary habits, both in rural and urban areas, due to several factors – easy availability of convenience foods, frequent snacking on energy dense fast foods, high consumption of packaged food in place of traditional home made food, etc. This transition has resulted in excess consumption of calories, saturated fats, trans fatty acids, simple sugars, salt and a low fibre intake. This has necessitated a revision in the existing dietary guidelines prepared 10 years a go by the National Institute of Nutrition, Hyderabad, which was predominantly rural centric. So, more than 100 renowned experts, belonging to varied disciplines of health and nutrition, have got together under the aegis of Science For Equity and Empowerment Division (SEED), Ministry Of Science and Technology, Govt Of India and Diabetes Foundation (India), to formulate a "National Consensus on Dietary Guidelines for Adult Asian Indians for Healthy Living and Prevention of Obesity & Diabetes". They have incorporated worldwide research and opinions in nutrition modulated to India specific data. They are simple, easy to understand by doctors and common public alike, and provision of standard diet charts catering to different regions of India will help people from all parts of India. Dr Anoop Misra, director, Diabetes, Obesity and Metabolism, Diabetes Federation Of India, strongly feels that the application of these guidelines will significantly help in preventing and halting diabetes and obesity epidemic in India. Countrywide adaptation of these guidelines is likely to have a significant impact on prevalence and management of more than 25 diseases, including diabetes and diabetes related diseases. What are these dietary guidelines for healthy living and prevention of diabetes and obesity? The energy requirement must be calculated on the basis of height, weight and activity level – a medium frame Indian male of 165cm height should weigh 62 kg, and if sedentary, would require 1850 K cal to maintain healthy weight. The daily carbohydrate intake, derived from whole wheat, unpolished rice, barley, buckwheat, oats, millet, whole pulses, legumes, and whole fruits like guava/apple etc, should be around 50-60% of total calorie intake, that is 250-300 gm/day. The total daily dietary fibre should be 25-40 gm. Hence high fibre food items like cereal, pulses, vegetables, salads, guava, amla, apple, pears, peaches etc should be eaten. In fact, 4 to 5 servings of fruits and vegetables per day are recommended. Visible fat (oil, butter, ghee) and invisible fat (from cereals and pulses), together should be less than 30% of total energy. This can be got by consuming 4 to 5 teaspoonfuls of a combination of two or more vegetable oils. Correct cooking methods like boiling, steaming, roasting, grilling etc, instead of frying can minimize the visible fat intake. Trans fatty acids should be less than 1% of the total energy. These are found abundantly in bakery products, ready to use soups and gravies and foods prepared in margarine and vanaspati ghee. Hence it is best to avoid these products. Ideal protein intake is 1gm/day for every one kilo of body weight. Thus for the average Indian male, this could be obtained from two bowls of cooked pulses, or 2 pieces of lean chicken/fish meat, or 500ml of double toned milk, or 9 servings of wheat flour. This much of protein will provide 10-15% of the total calories. Salt intake should be less than 5gm per day. So, we Indians need to drastically curtail the ever so popular consumption of salted potato chips (a big favourite of children), pickles, and salty fried snacks. Sugar in very small amounts and water in excess (about 8-10 glasses) every day, should cap it all. Apart from this, it is important to take small frequent meals at intervals of 3-4 hours. While eating out (which has become increasingly popular, even in small towns in India), one should choose small portion sizes of healthy snacks. Beverages like buttermilk, coconut water, and fresh lime with water are excellent substitutes for aerated and high calorie drinks. If adopted, these guidelines can, perhaps, have a significant impact on prevalence and management of obesity, diabetes and heart diseases, and save the native Asian Indian race from the ravages of non-communicable diseases (NCDs). A persistent and prolonged intensive lifestyle intervention could be the most effective tool to combat diabetes. At the same time, more effective drugs (and not glamorous pharmaceutical manipulations) are needed for those who cannot follow intensive life style therapy due to infirmity. basically due to rural-urban migration, mechanization, open market economy, increasing affluence, improved food supply, dietary liberalization and westernization, and physical inactivity due to rapid pace of urban life, resulting in more sedentary work. Leisure time activities have also shifted from outdoor activities to indoor entertainment, like television viewing and computer usage, both in children and adults. Also, women are generally reported to be physically more inactive than men, perhaps due to cultural influences on outdoor activities. But what is of major concern is that children and adolescents are showing decreased physical activity which is fuelling obesity and type 2 diabetes at a very young age. There is a general misconception in Indian parents that an obese child is a healthy child and that feeding oils and clarified butter to children is beneficial to their growth and imparts strength. Another important factor is the parental pressure on children to perform well in academics at the cost of sports and other physical activities. Lack of play fields in schools and open spaces around homes, has further aggravated the problem. Thus health interventions in both children and adults should be aimed at increasing the physical activity, along with healthier eating habits and health education. A carefully followed diet-exercise combination seems to work wonderfully in preventing or delaying the development of diabetes. This has been proved by a 10 year long Diabetes-Prevention-Programme (DPP) study, which has demonstrated the effectiveness of intervention programmes and changes in lifestyle in reducing the cost burden due to diabetes. This cost burden is imposed not only on the patient and her family, but also on society. There is loss in income and productivity. There are intangible costs in terms of pain, anxiety and suffering. Programmes directed specifically towards children have shown encouraging results. These should be aided with individual and community health initiatives, backed up by government efforts. The government would do well to sell coarse grains like millets through its public distribution systems. Effective strategies for making and marketing healthy food snacks are needed to counteract the increasing sale of junk food. In fact, some kiosks on the Ahmedabad highway sell tribal health foods in attractive packaging. As eating out is becoming fashionable even in small towns, it is necessary for the food and hotel industry to churn out more healthy recipes and popularise them. India, aimed at primary prevention of obesity and inculcation of healthy diet and lifestyle practices in children and adolescents who are at an increased risk for early onset of type 2 diabetes mellitus (T2DM) and coronary heart disease (CHD). Simple measures like regular physical activity, cutting off extra calories, eating more green vegetables and fruits, are likely to be beneficial in preventing diabetes. Eating less and walking more, does not cost anything and the gains are far too many. exercise a little more, and encourage our children to play outdoors rather than on a computer screen. November 14 marks World Diabetes Day - a global awareness campaign led by the International Diabetes Federation (IDF) that highlights the diabetes epidemic and aims to bring hope to the 285 million people living with diabetes worldwide. World Diabetes Day has been celebrated since 1991, when it was first created by the International Diabetes Federation and the World Health Organization. It is celebrated each year on 14 November, a date chosen to mark the birthday of Sir Frederick Banting, who is credited with the discovery of insulin. An official United Nation’s Day, World Diabetes Day is represented by the blue circle logo that is the global symbol of diabetes. This year sees the first of a five-year campaign that addresses the growing need for diabetes education and prevention programmes to tackle diabetes and its life-threatening complications. In addition to the lightings, hundreds of events will take place worldwide to mark the day, from individual acts of celebration to community-based activities. Examples include Desert Dingo Racing taking on Mexico’s gruelling cross-desert Baja 1000 race in the official World Diabetes Day car, and World Diabetes Day champions in the United States calling on people with diabetes worldwide to test their blood sugar at 14:00 hours (local time – irrespective of the time zone) and share the results online. IDF’s World Diabetes Day campaign aims to establish access to diabetes education as a right for all people with diabetes, to promote greater awareness of the risk factors and warning signs of diabetes, and encourage best-practice sharing in diabetes prevention. The campaign’s 2009 goal is to “Understand Diabetes and Take Control” and its key messages are: know the diabetes risks and know the warning signs, know how to respond to diabetes and who to turn to, know how to manage diabetes and take control. The need to increase diabetes awareness grows ever year with the increasing impact of the disease worldwide. The latest data, recently published by the International Diabetes Federation (IDF) in the 4th Edition of the Diabetes Atlas, show that 4 in 5 people with diabetes now live in low and middle-income countries and that the men and women most affected are of working age – the breadwinners of their families. IDF predicts that the total number will exceed 435 million in 2030 if the current rate of growth continues unchecked. Diabetes now affects seven percent of the world’s adult population and claims four million lives every year. The disease is a leading cause of blindness, kidney failure, heart attack, stroke and amputation. Diabetes will cost the world economy at least US$376 billion in 2010, or 11.6% of total world healthcare expenditure. By 2030, this number is projected to exceed US$490 billion. More than 80% of diabetes spending is in the world’s richest countries and not in the poorer countries, where over 70 percent of people with diabetes now live. The regions with the highest comparative prevalence rates are North America, where 10.2% of the adult population have diabetes, followed by the Middle East and North Africa Region with 9.3%. The regions with the highest number of people living with diabetes are Western Pacific, where some 77 million people have diabetes and South East Asia with 59 million. India is the country with the most people with diabetes, with a current figure of 50.8 million, followed by China with 43.2 million. Behind them come the United States (26.8 million); the Russian Federation (9.6 million); Brazil (7.6 million); Germany (7.5 million); Pakistan (7.1 million); Japan (7.1 million); Indonesia (7 million) and Mexico (6.8 million). When it comes to the percentage of adult population living with diabetes, the new data reveal the devastating impact of diabetes across the Gulf Region, where five of the Gulf States are among the top ten countries affected. The Pacific island nation of Nauru has the world’s highest rate of diabetes, with almost a third of its adult population (30.9%) living with the disease. It is followed by the United Arab Emirates (18.7%); Saudi Arabia (16.8%); Mauritius (16.2%); Bahrain (15.4%); Reunion (15.3%); Kuwait (14.6%); Oman (13.4%); Tonga (13.4%) and Malaysia (11.6%). The World Diabetes Day campaign can be followed online at www.worlddiabetesday.org; www.twitter.com/wdd; Facebook-http://tinyurl.com/o7o6kf and www.youtube.com/worlddiabetesday. Senior national and state journalists, including former BBC broadcaster Mr Satish Jacob, will be participating in the first anniversary celebration of Media for Children (M4C) on November 13. UNICEF chief of field staff, Uttar Pradesh, Ms Adele Khudr has also confirmed to attend. Mr Augustine Veliath UNICEF communication specialist and Mr Pushpendra Kulshreta, secretary Press Club of India, New Delhi are the other panelists. On 13th November 2009, M4C celebrate the anniversary of what can be termed as ‘media movement for children’. Media Nest, a Lucknow based pan –India forum of media professionals, has been organizing this bi-monthly event at the Uttar Pradesh Press Club with the support of UNICEF since November 2008. The forum which works for the welfare of journalists and their family has veteran journalist Kuldip Nayyar as its chief patron. Naveen Joshi, resident editor, Dainik Hindustan, Lucknow, broadcaster KK Nayar, BBC state correspondent Ramdutt Tripathi and IANS contributor Sharad Pradhan are patrons of this media forum. Media Nest has on this very special occasion invited all its members, as well as those NGOs and individuals who are working for children, to come together and jointly herald in India's Children’s Day in the true spirit of celebration. "We have through this media event attempted to ensure that the children of Uttar Pradesh, especially those from the under-privileged section of society get a voice, their demands are heard and their pain shared," said Ms Kulsum Talha, secretary general of Media Nest. The programme will begin with a presentation by Sahyog, a NGO working for women health and gender equality. The NGO will release a youth policy on the eve of India's Children's Day. The panelists will be former Vice Chancellor of Lucknow University - Professor Roop Rekha Verma - and Dr Neelam Singh. The second part of the programme will focus on how media can be partners in promoting women and children issues. Media as voice of children and partners in development issues. The two hour programme will begin at 2 pm. In the earlier 23 sessions M4C has focused media attention on AIDS-affected children, held an interaction with Dr Subodh Singh, the doctor who made Pinki Smile (girl with cleft lips), talked on how the state of sanitation is affecting the life of children in Uttar Pradesh, focused media attentions on the state of Minority children and their battle to get equal rights and full citizenships, UP's missing children, the state of justice in women's courts, and other key issues. The Judgement has directed the Govt. of Madhya Pradesh, Narmada Valley Development Authority and Narmada Control Authority not to proceed with any land acquisition and excavation for the canals until all the requisite measures under the Command Area Development (CAD) Plans and the Resettlement and Rehabilitation Plans are prepared and submitted to the Ministry of Environment and Forests and other authorities concerned and are approved and implemented pari passu with the engineering works. The decision on the CAD will first lie with the Committee of Experts to assess all studies/ plans/safeguard measures of Indira Sagar, Sardar Sarovar and Omkareshwar Projects which was appointed by the Ministry of Environment and Forests, in 2008. The Committee would scrutinize the plans, approve and guide the Government. The Narmada Control Authority established and empowered through the Narmada Water Disputes Tribunal Award, 1979 and the Narmada Water Scheme (1980 and 1987) would be responsible for the overall monitoring and will have to ensure that the environmental impact mitigatory measures and resettlement and rehabilitation measures are properly planned, resources for the same are made available and implemented as per the judgement. major sons and all other provisions on par with the submergence (reservoir) affected families, as also the benefits granted in the policy to the landless. The Judgement also refers to the canals planned to be constructed in the already irrigated areas wherein there is no need for further irrigation through canals, such as villages already falling in the Sardar Sarovar and Maheshwar dam affected areas and directs the authorities to review the canal network and CAD Plan to minimize displacement, in the context of increasing people’s struggle and agitation against land acquisition for development projects across the country and considering that the affected people are losing faith in the State and its promises as well as capacity to rehabilitate them. While the major interim order has emphatically entrusted the responsibility to the Narmada Control Authority to ensure monitoring of all the environmental safeguard measures and the implementation of R&R, it has also directed the State of Madhya Pradesh to establish a Grievance Redressal Authority for the purpose. 1999 and 2001 and since the state government has not amended its Panchayati Raj Act to include Section 4(i) of the Central PESA Act, the Act can’t be applicable unless the State legislature enacts an amendment to that effect. Citing an earlier judgment by the same Bench, the High Court further ruled that when the land acquisition is under a Central Act (in this case the Act of 1894), consultation of Gram Sabhas prior to land acquisition is not to be mandatory for projects in Madhya Pradesh. The Order, however, notes that the State of Madhya Pradesh should have incorporated the provisions of the PESA Act including Section 4(i) in the State level Panchayat Act. leaves it open to the canal-affected to approach the Hon’ble Court with further details. On the whole, the High Court’s order, is indicative of further progress of the Narmada project affected families, by extending the rights and privileges of R&R to all categories, beyond reservoir-affected and upholding the great value and importance of environmental measures, including command area development as pre-conditional to any work such as land acquisition and excavation of the canals, along with the principle of minimizing displacement, while planning of a development project. The case has been disposed with a direction to the Narmada Control Authority to submit three-monthly reports on implementation of all the social and environmental measures related to the Project by GoMP and NVDA. 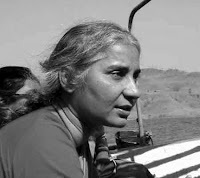 Narmada Bachao Andolan respects and welcomes the judgement as highly progressive, Since it holds the environmental mitigatory measures as mandatory and pre-conditional , it expands the definition of the project affected, guaranteeing them the right to life under Article 21 of the Constitution and admitting and the pressing need to review the Indira Sagar and Omkareshwar projects, towards minimizing displacement and saving prime agricultural irrigated land. The Andolan shall continue struggle at the legal level and on the ground to centralize the right of the adivasis and other nature-based communities for their right to informed consultation and consent with respect to all development planning projects. The PIL was filed on July 18th and continued till the 28th of October, 2009. Medha Patkar pleaded at length for the petitioner-farmers and adivasis. Senior advocates Ravish Agarwal, Additional Solicitor General Naman Nagrath and Adv Arpan Pawar pleaded for the Government of Madhya Pradesh and NVDA while Advocates Radheshsyam Gupta for MoEF and Dharmendra Sharma appeared for NCA. The Republic of Mauritius in collaboration with the World Health Organization Afro Region and the International Diabetes Federation (IDF) today opened an International Conference on Diabetes & Associated Diseases in Port Louis, Mauritius to highlight their concern about the rapid growth of the diabetes epidemic throughout Africa. The conference will run from November 12 and end on November 14 - World Diabetes Day. t developments and practical management and prevention of diabetes and its complications. Participants will also take stock of the latest scientific evidence-based best practices to address the epidemic of diabetes and related complications - http://www.gov.mu/portal/sites/diabetesconf2009/index.htm. The goal is to build a strategic alliance among health professionals that will provide the momentum to implement both the National Diabetes Services Framework and procedures, and the UN Resolution on Diabetes (Res.61/225). Africa will have the highest percentage increase in the number of people with diabetes in the next 20 years because of rapid industrialization and general improvements in living standards over the past five decades according to the latest data from the IDF Diabetes Atlas 4th edition. At least 80% of people in Africa with diabetes remain undiagnosed. The picture is bleak for those already affected by diabetes as the IDF data shows that in Africa, most of those who die from diabetes are in the economically productive age group (30 to 60 years). "No country is immune to diabetes and no country has all the answers to this common enemy that we confront. No country has yet managed to reverse the trend of rising prevalence. Defeating diabetes will take every ounce of commitment and ingenuity that we can summon. It is time to think creatively and to break down old paradigms. Studies show increasingly strong linkages between diabetes and many other diseases, such as heart disease, tuberculosis and HIV/AIDS," said Professor Jean Claude Mbanya, President of the International Diabetes Federation and co-chair of the Scientific Committee of the conference. Mbanya added, "IDF's aim is to achieve sustainable health systems as called for in United Nations Resolution 61/225, and to catalyse funding that is committed to helping health systems develop sustainable, cost-effective measures for prevention and care of diabetes and other non-communicable diseases"
Africa is not alone in fighting the diabetes epidemic. IDF data shows that 285 million people worldwide now live with diabetes (4-in-5 are in developing countries). That number is expected to exceed 435 million in 2030 if the current rate of growth continues unchecked. Diabetes will kill four million people in the coming year, more than HIV/AIDS and Malaria combined. Diabetes has become a development issue which threatens health and economic prosperity in low- and middle-income countries. IDF predicts that diabetes will cost the world economy at least US$376 billion in 2010, or 11.6% of total world healthcare expenditure. By 2030, this number is projected to exceed US$490 billion. More than 80% of diabetes spending is in the world's richest countries and not in the poorer countries, where over 70 percent of people with diabetes now live. Globally, only one other country has a larger proportion of its population with diabetes than Mauritius, the Pacific island of Nauru. "If one needed a barometer for assessing or predicting the direction of the global diabetes epidemic, we do not need to go past the Indian Ocean island nation of Mauritius with its population of about 1.3 million," said Professor Paul Zimmet, Co-Chair of the IDF Task Force on Epidemiology and Prevention from Australia's Baker IDI Heart and Diabetes Institute. Zimmet, who is co-chair of the scientific committee and a keynote speaker at the conference, said the multi-racial population of Mauritius (Asian Indian Hindus, Asian Indian Muslims, Chinese and Creoles) has undergone rapid industrialization and economic growth over the past several decades. This brought in its wake a dramatic shift in the disease pattern. He noted that these ethnic groups constitute two-thirds of the world's population. Mauritius acts as a microcosm of the global epidemic and data from successive studies here have been critical for IDF in its global predictions of diabetes. Along with the Mauritius Ministry of Health and Quality of Life, Zimmet and Sir George Alberti have been conducting surveys in Mauritius since 1987 (1992, 1998, and 2004) which have shown that prevalence rates for diabetes and its complications are very high. Between 1987 and 1998, there was a 38% increase in diabetes numbers. In the most recent 2009 survey, (led by Sudhir Kowlessur and Professor Zimmet), there has been a further dramatic increase in numbers. "This bodes poorly for India (50.8 million) and China (43.2 million), the two nations that already have the most people with diabetes globally as well as the many nations around the world with immigration of these ethnic groups," said Zimmet. Zimmet also voiced his great concern about the dramatic increase in diabetes in Indigenous populations citing the example of Australia's Aboriginal population. "In our rich nation," he said, "we have close to the highest world rates of diabetes, diabetic kidney disease and amputations in the world. Diabetes is the fastest growing disease worldwide and one of the greatest public health challenges of the 21st Century"
Professor Mbanya said, "Faced with these alarming numbers in Mauritius, it is especially important that we focus on the country this World Diabetes Day. This international conference marks the start of the political action necessary to reverse the diabetes epidemic worldwide." For the next five years IDF is focused on Diabetes Education and Prevention through its World Diabetes Day campaign.